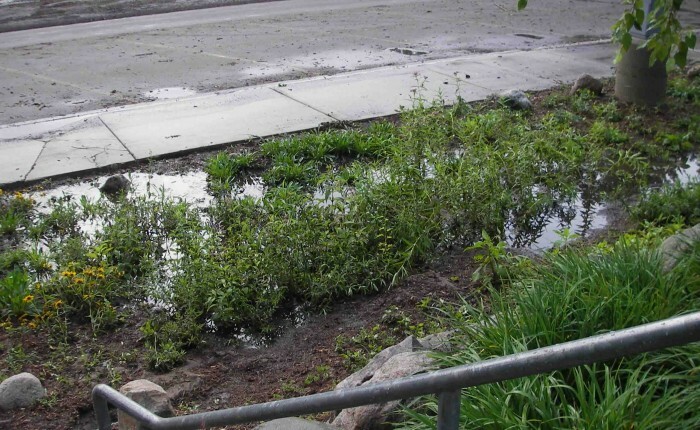 For two years beginning in 2009, MRWA Program Coordinator Terry Stilson, and FSU Instructor Cindy Fitzwilliams-Heck, have worked with different FSU departments in planning a storm water project for the campus. Eighty percent of the campus’s storm water drains to an Ives Avenue stream. This stream flows for approximately a quarter mile and enters the Muskegon River. Storm water carries pollutants and contributes to the river’s thermal pollution. Because of the fluctuating water level after storm events, erosion is taking place on the hill alongside the stream. This spring marked the culminating activities of the rain garden project (pictured above is the rain garden six weeks after planting). The FSU Physical Plant (Vice President Michael Hughes and Grounds Manager Will Gasper) constructed the rain garden following plans from students in the Built Environment department (John Schmidt, professor). Three swales were also constructed on the hill above to channelize and decelerate the storm water flowing downhill to the garden. On June 1, Jean LaLonde’s Earth Science students from Big Rapids High School planted over 1100 plants in the rain garden and swales. Surveying Engineering students (Robert Burtch, professor) surveyed and mapped the rain garden area. A video of the project is being created by students in FSU’s Television Production department (Connie Morcom, professor). Professor Scott Herron had his biology students propagate plants and create rain garden lesson plans. Fitzwilliams-Heck’s students created designs for the rain garden sign and brochure. Appreciation also is extended to the Mecosta Conservation District, Karen Motawi, St. Peter’s Lutheran School rain garden, Stilson and Fitzwilliams-Heck for donating plants. Morgan Composting also contributed some of the composted soil. Update: On the night of August 2, the rain garden was put to its first test. Almost 6 inches of rain fell in the Big Rapids area in a short duration of time. The whole parking lot and rain garden were flooded. The water mark on the light pole in the garden was about 2 feet high. Although, the garden lost some of its mulch, the plants stayed intact. The force of the water did move some of the rocks installed in the swales! 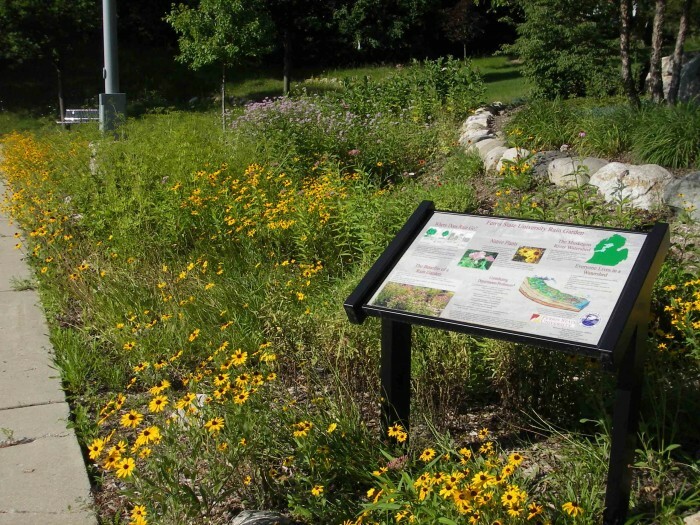 The rain garden sign was installed in October 2011 and the bench in November 2011. Students from the Ferris TV Production class created three videos of the project. Stop by and see the garden and visit with us!